This post is brought to you by a Healthy Slice sponsor. Honestly, I’m not sure why I haven’t done this sooner. 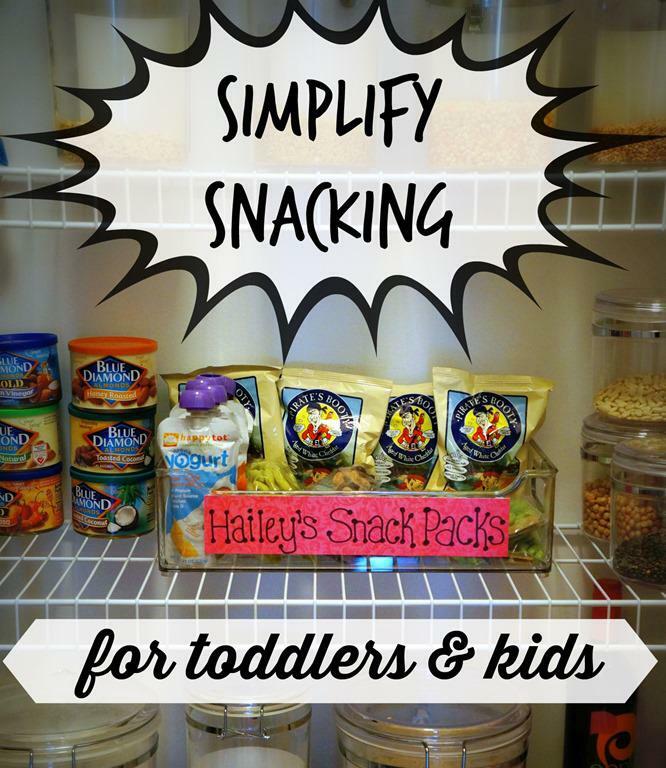 On our way to the gym, I always fill a little snack bag with something for Hailey, but since our go-to snack is usually a fruit or veggie, I often spend at least 5 minutes scouring for a more shelf-stable snack to pack. 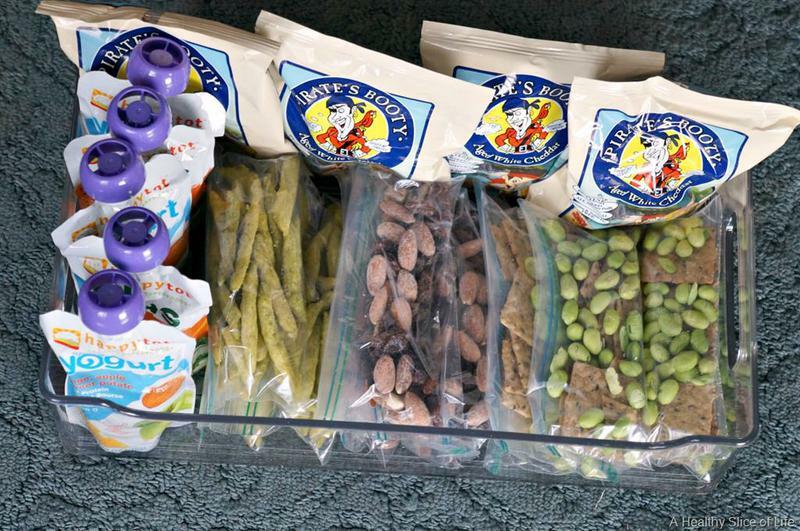 Using this new method, I have a month’s worth of snacks ready to go and it took me all of 10 minutes to pull together. I love that Hailey can choose what she wants, but they are all mom-approved. Any way I can give her some sense of power at age 2.5 is a win. So what all did I include in this toddler super snack tray? Let’s take a look! 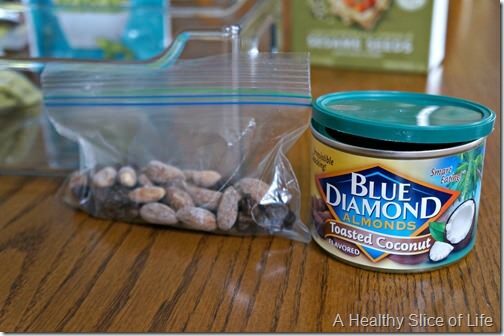 I started with her favorite- Blue Diamond’s Toasted Coconut Almonds. Like Hailey demonstrated during the taste test video, she has a serious love affair with these things and will ask for them by name. I’m as addicted as she is (I love me some Habanero BBQ!) and I love that she can’t get enough of this healthy fat and protein snack. I mixed a handful with raisins because who doesn’t love a fruit ‘n nut combo?! I also like to incorporate veggies whenever possible, so we are big fans of these Snapea Crisps, too. 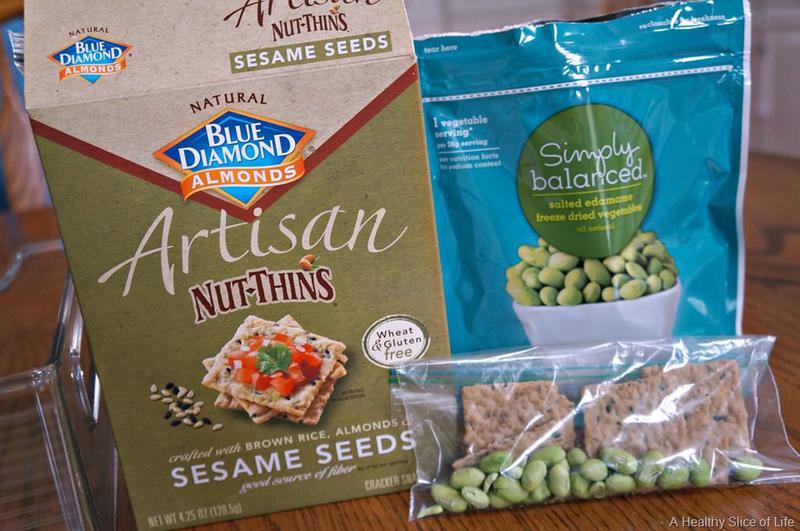 These Blue Diamond Nut Thins are crispy and gluten free (made with brown rice, almonds and sesame seeds). 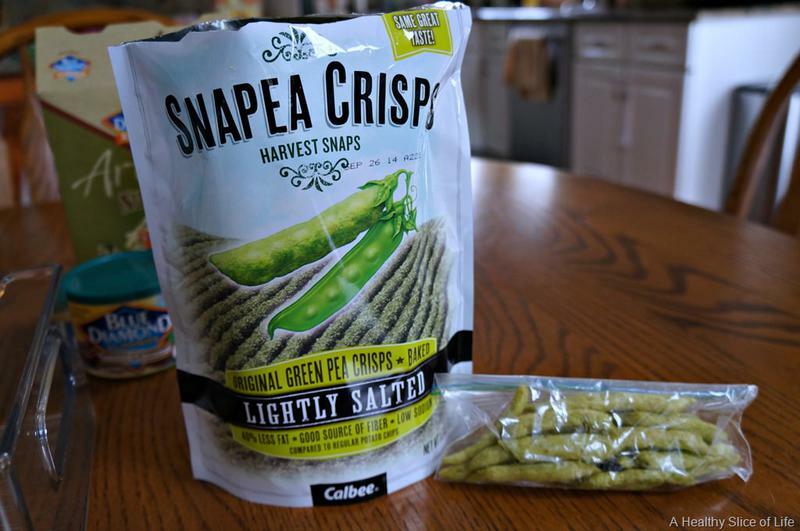 Though they are perfect with hummus, they also are great on their own or paired with freeze-dried edamame. Pairing macronutrients for snacks (carbs+protein) is always a win in my book. I also threw in a couple organic yogurt/fruit/veggie pouches and some packs of Pirate’s Booty for fun (OK, mostly because I love to giggle when Hailey says Pirate’s Boo-dee). And there it is- a month’s worth of no-brainer snacks! So far, Hailey loves it. She can reach the entire tray and gets so excited when I tell her she can go pick out a snack to bring with us. 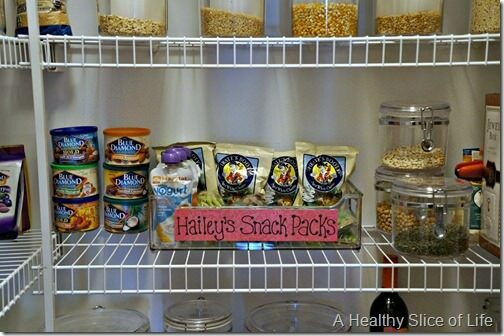 What are your favorite shelf-stable snacks for kids? 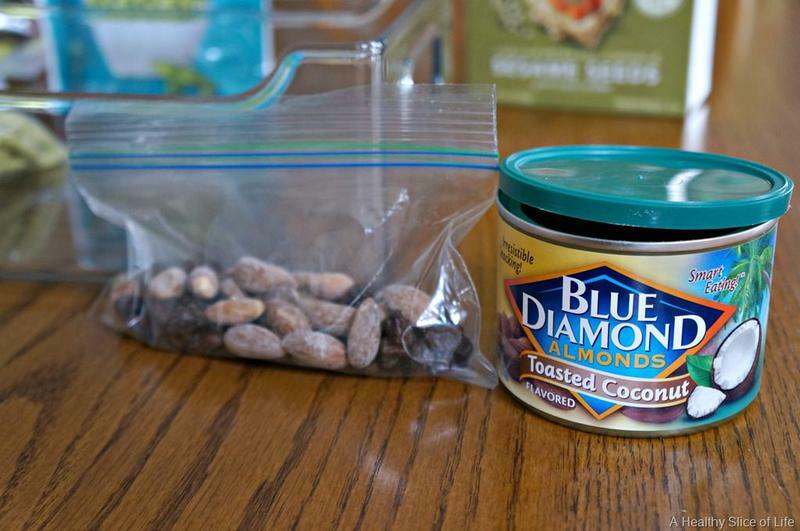 This post is sponsored by Blue Diamond Almonds, but all opinions and thoughts shared here are 100% my own. Carla recently posted..The importance of mattering. My son really likes the veggie straws! I love the idea of empowering toddlers to choose their own mom-approved snacks. Katie @ Pick Any Two recently posted..Things New Moms Are Supposed to Just Know…That I Didn’t! Such a great idea!! I might steal it!! 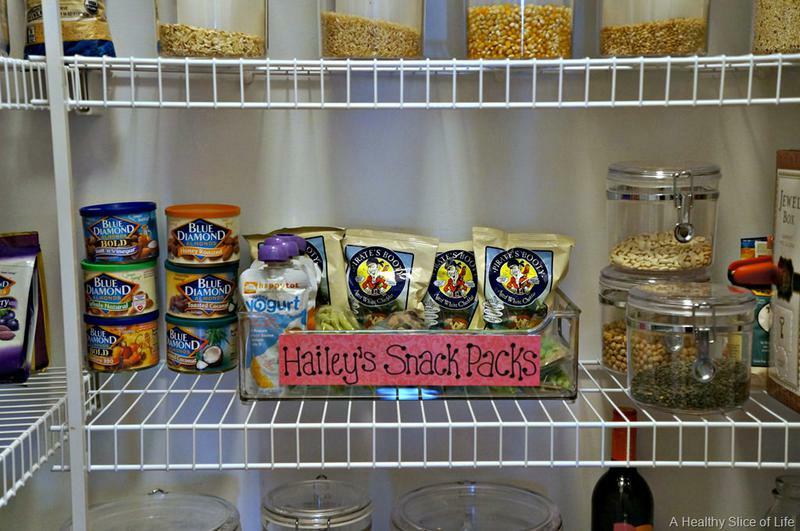 I have a shelf in our pantry for her snacks but I need to get “snack bags” again so I can have them ready to grab and go. My favorite snack for her is trail mix. She loves it and it’s super simple. I love Pirate’s Booty! And my son does too. We have the huge box of single serving bags from Costco in our pantry now. I love the idea of prepping snacks ahead of time. I am so doing this. My son also loves the squeeze packs – applesauce and sweet potato/white beans are his favorite ones. In the fridge I have put a small storage bin with his string cheese and yo baby yogurts, so that I can keep them all together for quick grab and go snacks. Also I always keep diced watermelon. He and I both like that! Marjorie recently posted..Weekly Weigh In Video. Plus Cycling Indulgences/ Weekly Points. Seriously? Why have I never done this? I love it! 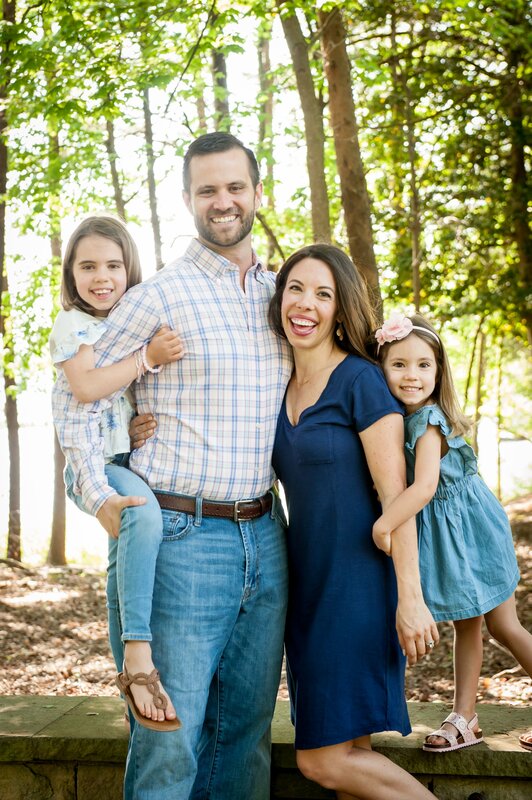 You’re right- anything that gives them the power to choose is a win-win, and having it all organized will save you time and stress when the baby is here. I love this idea! I’m always looking for new snack ideas for Aiden. We frequently go for a banana or watermelon, but I buy baby biscuits and organic fruit snacks too. I can hardly wait until he can eat nuts and things like that. I am going to incorporate some of those nut thins I think. Thanks for the great ideas! We’ve been in a snack rut lately – usually yogurt, peanut butter and crackers, or a squeeze pouch. I’ll definitely be incorporating some of your ideas! You are just full of great ideas! Why have I never thought of this before? Great idea! Hunter LOVES the fruit/veggie pouches. I told myself I wasn’t going to buy those on a regular basis, but after realizing how much he loves them and how convenient they are, I’m ALL about ’em! I LOVE this idea. Maybe I should start doing this for my son as well so it gives him a choice, and it saves some time for us if his snacks are already made. I’m already picturing where I can put a snack basket in our house. I always mix my Blue Diamond almonds with raisins, too! And I am totally with Hailey. The coconut flavor is the bomb! I love this! While I don’t have a toddler yet, this would be useful for my husband’s snacks he takes to work. To have them all in one place to make packing easier. Question for you: how early in your pregnancy did you begin prepping freezer meals for once baby arrives? I didn’t start prep until a month or so ago since I was worried about how long things would last. I typically follow a 3-month rule, so I didn’t want to risk it! I love edamame – I’ll have to get a bag of the freeze-dried variety sometime to try! Parker loves yogurt covered raisins! I love that you feed your kids healthy snacks! You are BRILLIANT! Emmett’s still a wee bit young to just go in and grab something on his own, w/o grabbing everything, BUT having things pre-packaged would make after work time much easier. Currently, we get home and I run around, grabbing him milk & a snack, go change, get stuff put away, dinner started and then head out the door to play or walk. If we had something pre-made, it would be grab and go, and probably save me 10 minutes. What a great plan-ahead idea!!!!!! I love this! 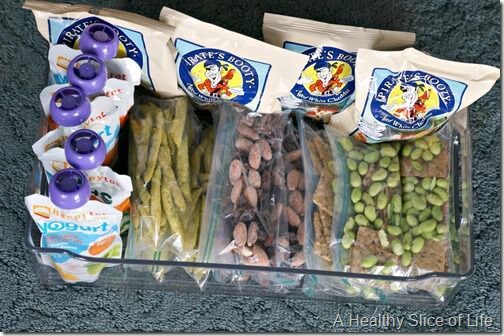 What a great idea to pre-pack her snacks! I need to do that so I’m not scrambling to grab something as we run out the door. Plus I want to start allowing him the option of picking out his own snacks when he’s hungry so having them ready to go would be so helpful! New reader here and I’m LOVING your blog! We also have a kind of snack station for my daughter (who turned 2 in December) to help empower her with healthy snack choices. However ours are usually individually packaged bags (the veggie straws are her favorite!) we buy from Costco. I see that you buy a large bag and then portion them out. How fresh do they stay the entire month? I’ve thought of buying a big bag and doing the same thing but was afraid that they would go stale. Hey Danielle- thanks for your kind words! As for the longevity, I think it depends on what kind of snacks you portion out. I haven’t had any issues with staleness, but honestly, she tends to pick the portioned out snacks (almonds or snap peas) sooner than the other ones, so they don’t really end up sitting for a month and obviously the pouches and individual packages can last. Great question though! Maybe to be safe it would be best to do 2 weeks worth at a time? 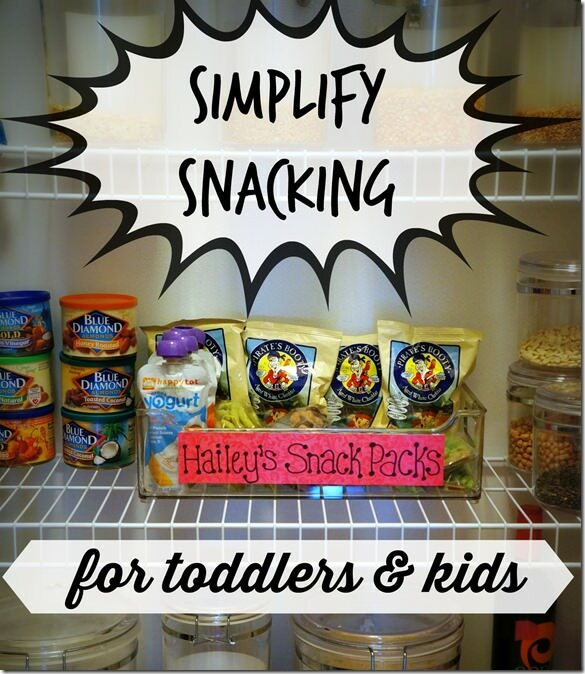 This is a great idea and ensures little ones always have a healthy snack to grab. It also works for adults – I have been doing this lately because I tend to eat too much if I snack from the bag. Putting together the right size portions makes a difference and I managed to shed a few pounds. Awesome post! I love these ideas for snacks. I have been thinking about getting the yogurt pouches for an upcoming road trip. I’m curious, though, if they are yogurt, how are they shelf-safe?